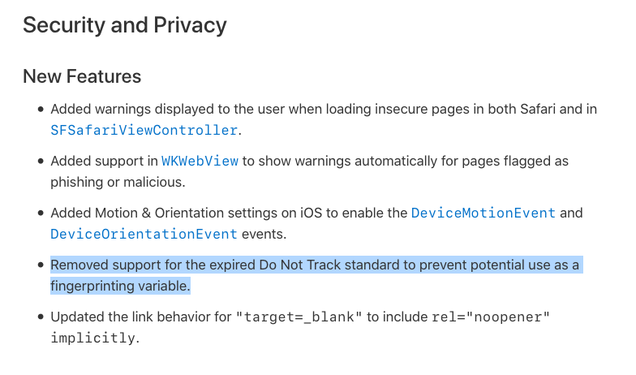 As spotted by DuckDuckGo, the release notes for the newest version of Safari say the company has “removed support for the expired Do Not Track standard to prevent potential use as a fingerprinting variable.” In other words, whether or not the DNT signal was being sent it was being used as a way to track people. Irony alert. Apple’s decision may be in response to the fact that the Do Not Track project quietly ended last month. The privacy option was also redundant now that Apple has a built-in anti-tracker, which blocks cookies and was introduced in 2017.